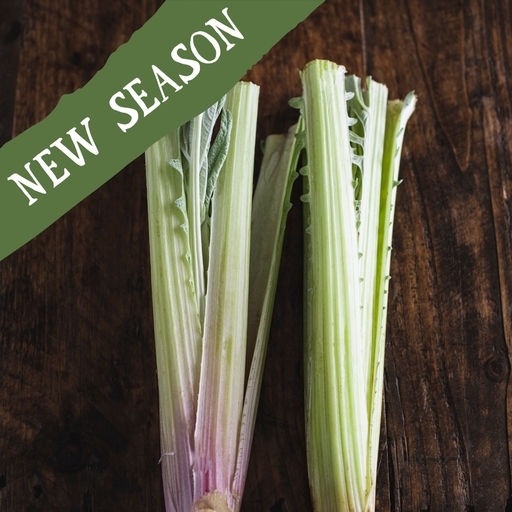 One of Guy’s favourite veg – cardoons are seasonal, quirky, and hard to come by. A relative of his beloved globe artichokes, cardoons’ long leaf ribs taste like a cross between celery and artichoke hearts, with a pleasing hint of bitterness thrown in for good measure. Sublime baked in a creamy gratin or fried as fritters. Peel the tough, fibrous edges away with a knife or a peeler. Chop the ribs into 2cm chunks and drop them into acidulated water (water with a squeeze of lemon) to stop them browning, until ready cook. Boil for about 15 mins or until tender. To make fritters, shake the boiled cardoons in a plastic bag with a little flour to coat. Dip the chunks in a beaten, seasoned egg and roll in breadcrumbs. Deep fry in batches in an inch of oil until just starting to colour. Serve immediately, with aioli or mayonnaise for dipping. Keep in the bottom of the fridge. Guy’s been experimenting with growing cardoons on a patch of land on the farm for a few years now. They’ve either tasted excessively bitter or run to seed early, thwarting his plans. Now it seems, he’s finally cracked it with a new variety sown last spring.